With the common name of ‘Baby’s Breath’, Gypsophila paniculata is probably better known as a cut flower than as a garden plant. However this long flowering plant has earned a place in many gardens. The masses of flowers that cover the plant from spring to autumn add an airy touch to the garden. Although this is a somewhat straggly plant, it does make up for its shortcomings with the wonderful display of flowers. Flamingo – Small pink flowers. Grow it for cut flowers, or just for the mass display of dainty white flowers from late spring through to autumn. A large clump in the garden border will as a light airy look, an excellent plant against a darker green background. Best grown in a warm sunny sheltered position, Gypsophila paniculata will reward the gardener with flowers for many months with a little care. 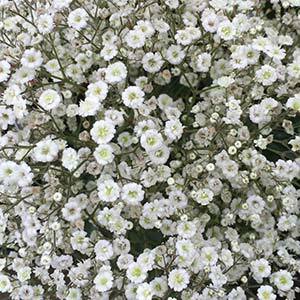 Gypsophila paniculata does require good light to flower well, so avoid overly shaded positions. Regular applications of fertiliser from spring through summer, along with attention to watering will ensure a good flower display. You can be prune plants back after flowering to encourage a stronger second flush. This can be carried out 2 – 3 times a season in good conditions. Choose a sunny position and a deep fertile soil.